T-Shirts are 100% cotton, traditional cut, U.S. made (union made when available) Sizes S, M,L, XL (unless indicated otherwise) Some shirts are available in XXL and XXXL at $2 additional charge. Actual colors may vary slightly. ONLY the sizes that we have in stock will appear in the size selection box. Beautiful woodcut style design by Erika Weiss on natural, unbleached 100% cotton shirt. Union made & screen printed. Available only in sizes mentioned. 100% cotton union-made Lifewear brand 5.7 ounce T-shirt. White imprint front & back on BLACK shirt. Also available in white on PURPLE shirt. Select size & color. Longtime New England folksinger Charlie King hads a song entitled "Our Life Is More Than Our Work" and the rerfrain is "and our work is more than our jobs" These words have been a favorite of ours or years. So we're glad to offer these shirts. 100% cotton union-made Lifewear brand 5.7 ounce T-shirt. White imprint front & back on PURPLE shirt. Also available in white on BLACK shirt. Longtime New England folksinger Charlie King hads a song entitled "Our Life Is More Than Our Work" and the rerfrain is "and our work is more than our jobs" These words have been a favorite of ours or years. So we're glad to offer these shirts. ONLY ADULT SIZE SMALL REMAIN AVAILABLE. Navy blue 100% cotton shirt with ivory and white imprint on front. 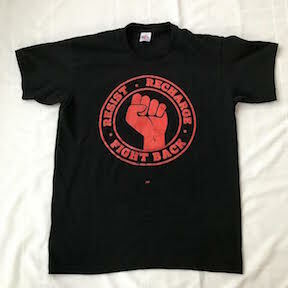 100% Cotton, Full front Red silkscreened imprint on black union-made T-Shirt. © 2018 Cotton grown, knitted, dyed, cut, sewn and printed in the U.S.